Enjoy old-world luxury in Rovos Rail’s wood-panelled coaches, with accommodation for a maximum of 72 guests. The train consists of the locomotive, generator car, staff car, guest sleepers, non-smoking lounge car which can accommodate 26 guests, one or two dining cars, a smoking lounge car, and the observation car with ample space at the end of the train. Meals are accompanied by only the finest selection of South African wines. 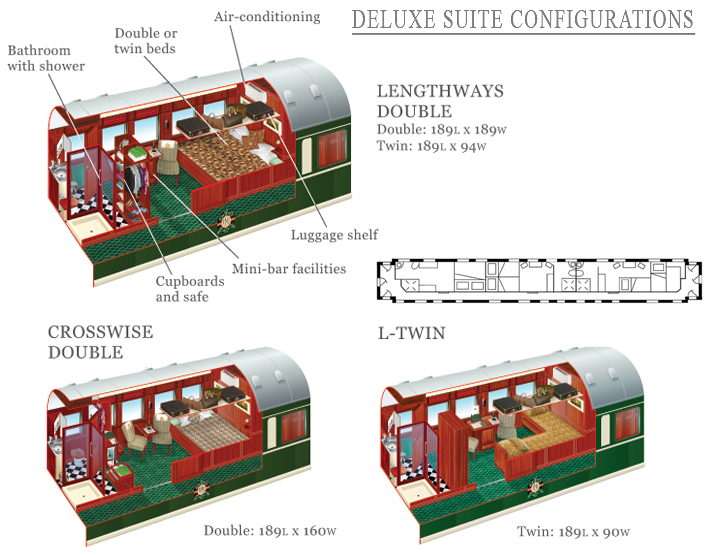 The 50% reduced rate per person includes accommodation in a Deluxe Suite for two people sharing and is fully inclusive of all meals, alcoholic and other beverages on board, the off-train excursions, 24-hour room service and a limited laundry service. 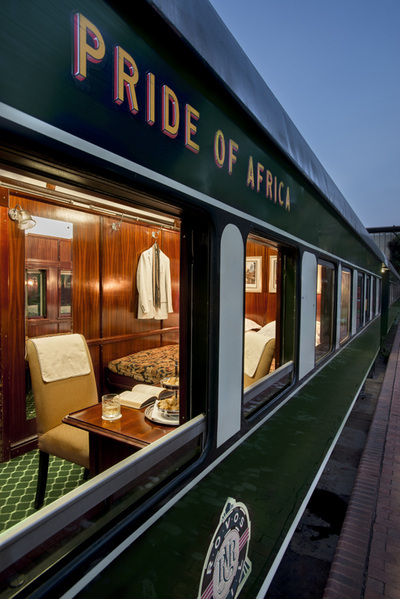 The journey travels between Rovos Rail Station in Pretoria and Cape Town or vice versa. 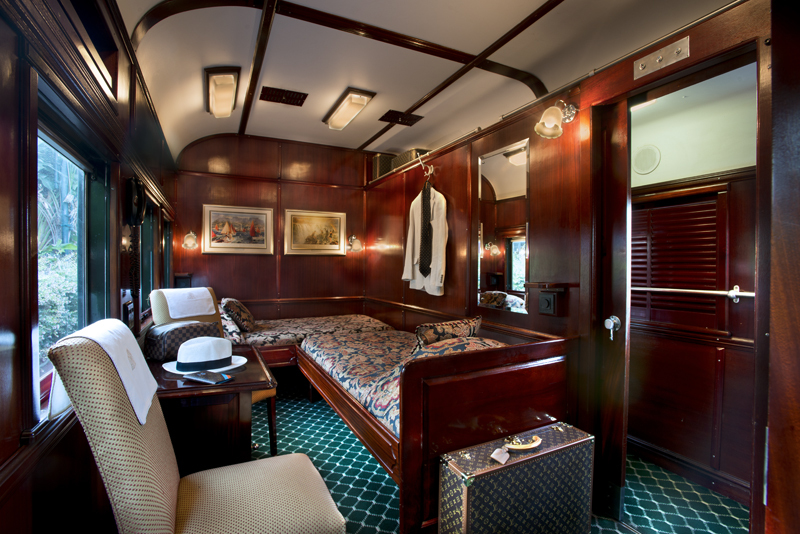 The offer is for a one-way journey only and does not include pre- and post-tour accommodation, flights and transfers, staff gratuities, French Champagne or memorabilia purchases. 2 FOR 1 SOUTH AFRICAN RESIDENT SPECIAL @ R15'550 P.P. The Rovos Rail train arrives at 10h00 in Kimberley Station. You will be collected at the station and taken your visit to the Town, Big Hole and the Diamond Mine Museum. The train departs Kimberley at 12h30 and you proceed on your overnight journey that runs via De Aar and Beaufort West to Matjiesfontein. Early this morning (08h15) you will enjoy a visit to historic Matjiesfontein. Your train journey continues at 10h30 as you proceed via Touws River and Worcester to Cape Town. Your luxurious journey is completed at Platform 24 at 18h00 in Cape Town station, where you continue with your onward arrangements. This morning you depart from Platform 23 at Cape Town Station at 11h00. Your journey takes you towards the town of Worcester, and then onto the historic village of Matjiesfontein, with its Victorian era atmosphere. You arrive here at 18h00, and there is time for you to visit the area. The Train takes you further inland, to the famed town of Kimberley, where you arrive at 14h30. You are met by a bus which takes you on a fascinating tour of the Big Hole (the largest man-made excavation in the world) and the Diamond Mine Museum. Return to the train for the 16h00 departure. Enjoy some leisure time before getting ready for your sumptuous dinner at 19h30. Your tranquil journey continues to Pretoria, and Rovos Rail’s Capital Park Station, where you arrive at 12h00 in plenty of time for your onward arrangements. 2 FOR 1 SOUTH AFRICAN RESIDENT SPECIAL @ R20'300 P.P. Breakfast is served as the train departs Mpopoma. Lunch is served whilst travelling along the eastern edge of Hwange Park along one of Africa’s longest stretches of straight railway line – 114km. Arrive Kennedy for a game drive at The Hide. Dinner is served in the dining car/s en route to Thompsons Junction for the overnight stop. At 07h00 the train departs Thompsons. Breakfast until 09h30. At 10h00 you will arrive in Victoria Falls. Breakfast is served as the train leaves baobab country. Lunch is served as the train crosses the Tropic of Capricorn towards Warmbaths and Nylstroom. Breakfast is served from 7h00 onwards until the train arrives in Pretoria at 10h00. This morning there is a 06h00 wake-up call… and you can enjoy tea, coffee, juices and pastries in the dining car/s before setting-out on a game drive in the Nambiti Private Game Reserve. You return to the train in time for a delightful brunch at 11h00 before heading off to Estcourt. Here you disembark (14h00) for a 40-minute drive to Spionkop Lodge. At the Lodge you have a choice of two excursions – either the escorted tour of the battlefields; or another game drive (in the Spionkop Game Reserve). You will return to the Train in time to freshen-up before enjoying another excellent dinner at 19h30. This morning the train departs Estcourt and descends the escarpment ( you will be enjoying breakfast which is served from 07h00), as it journeys to Lions River Station. You arrive here at 10h00, and you are taken to a visit to the famous Ardmore Ceramics Gallery. Your excursion includes an equestrian display; and then enjoy some tea while overlooking the River. You are taken back to the train at 12h00, and lunch is served as you traverse the incredibly scenic Valley of a Thousand Hills. Your journey is completed upon arrival at Durban Station at 16h00. Your journey starts when the train leaves Durban Station at 10h00. You can explore the train before enjoying a delicious lunch, which is served at 13h00m, as you travel to Lions River station. At 15h00 you are taken on the excursion to the famous Ardmore Ceramics Gallery. The visit includes an equestrian display and tea, which you enjoy overlooking the River. Then it’s back on the train, where you have time to relax and then freshen-up for dinner, which you enjoy at 19h30, as the train climbs the escarpment en route to Ladysmith. 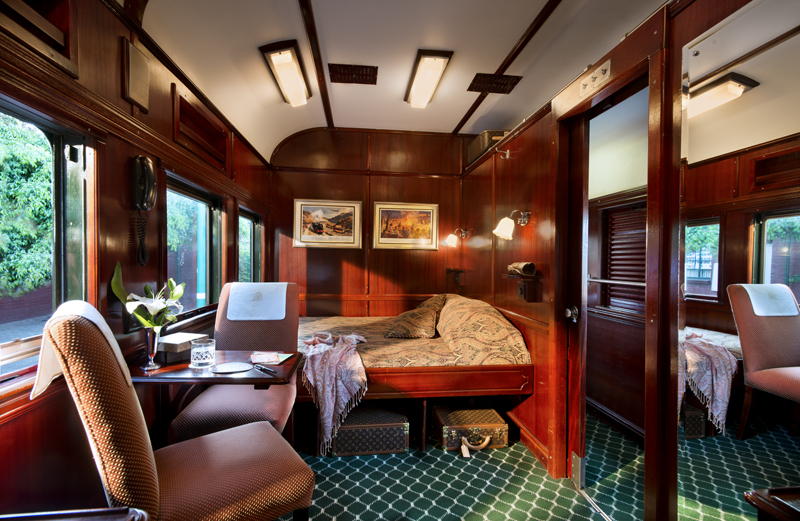 An early start this morning as you have a 06h30 wake-up call – and before leaving for your excursion, enjoy tea/ coffee, juice and pastries in the dining car. Your excursion choice for this morning: Option 1 - Game drive in Spionkop Reserve; Option 2 - Spionkop battlefields escorted tour. Whichever you choose, you will be back at the Train for 13h00, where you enjoy an excellent lunch. By 15h00 you are at Elandslaagte where you are taken for a game drive in the Nambiti Private Game Reserve. 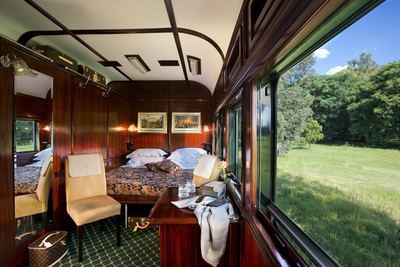 After taking in the scenery, and wildlife, return to the Train for dinner at 19h30. 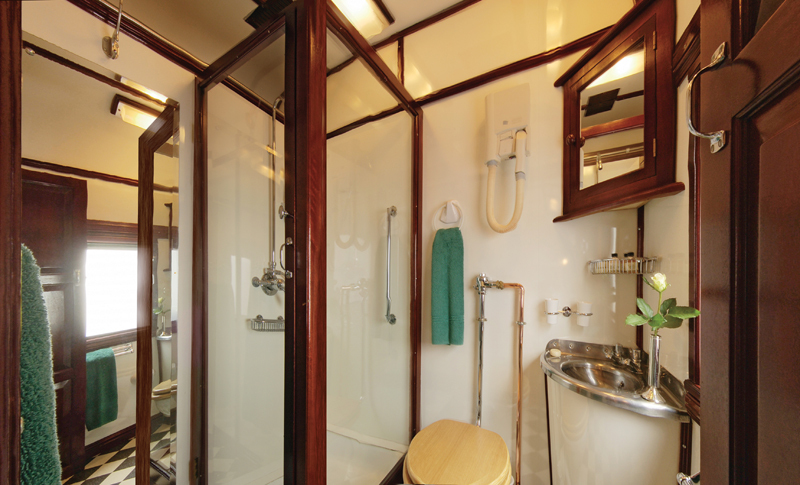 This is your last morning on the Train, and you can enjoy breakfast at you journey traverses the Highveld….. you have time at leisure, and to watch the scenery go by before a delightful lunch at 13h00. 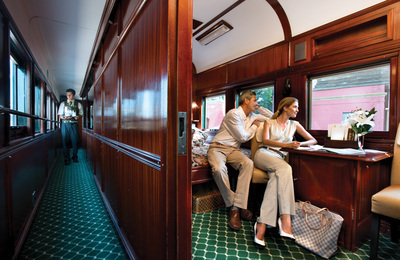 Your luxury train journey ends at 16h00 with your arrival at the Rovos Rail Station in Capital Park, Pretoria. Terms and conditions apply. Valid for new bookings only. Dates are specific. Rates are based in Deluxe Suites only. This special offer is subject to availability and valid exclusively for residents from South Africa and bordering countries. (Botswana/Lesotho/Mozambique/Namibia/Swaziland/Zimbabwe). Read more on the Rovos Rail Booking Terms.